This week is another big one for Aimtell, as we are introducing our new integration with Zapier! For those who are unaware, Zapier allows you to connect various third-party apps in order to share data between them. With our new integration, you can now link your apps with Aimtell in order to schedule push notifications that incorporate data from those connected apps. Pretty cool, right? Zapier currently integrates with hundreds apps, and more are being added all the time. This integration saves you countless hours by automatically linking your data and setting up campaigns that can be sent to your subscribers instantly. What’s great about our new integration (and Zapier itself) is that it is incredibly easy to get set up. On our end you simply head to your Aimtell dashboard > click settings > select ‘API Key’. Your unique key is what you will use on Zapier in order to link your Aimtell account. Once you are set up, you can start creating your own ‘zaps’ (connections between Aimtell and other third-party apps). Zapier’s dashboard is simple to use and involves a quick 2-step process to set up a new zap. First, you’ll choose your trigger, which is any app you wish to link with Aimtell to use for a new campaign. For example, you might select your Twitter account and decide you wish to send a notification every time you send out a new tweet. Our integration comes in step two where you select your action. 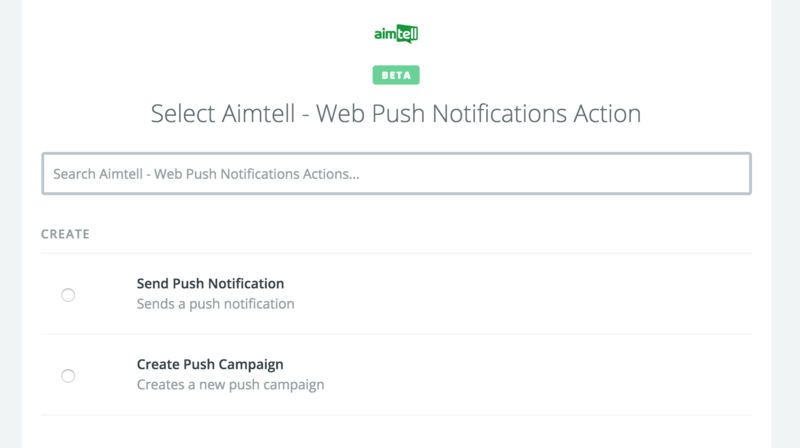 Select Aimtell and you will see there are two possible actions: Send Push Notification and Create Push Campaign. You’ll quickly notice it is very similar to what you are already used to doing on your Aimtell dashboard with all of your other push campaigns! Integrate your MailChimp account in order to sync your email campaigns and have the same ones set up in Aimtell. Connect your Instagram account and share new posts either with all your subscribers, or choose a specific segment to send to. Send push notifications based on Facebook posts you publish. Don’t let those ideas limit you, however! There are so many other apps that integrate with Zapier, giving you countless options for new campaigns you can create. We understand that your digital marketing efforts include a variety of different apps and platforms, and that is why we decided to integrate with Zapier. We hope you will enjoy this new feature and feel confident once you get started with it, it will become a crucial part of your marketing plan! If you need more help getting started with Zapier, check out our technical walkthrough here. As always, let us know if there are any other features you’d love to see by sending us an email or commenting below! Tags: digital marketing, product feature, web push notifications, zapier.